We believe in the benefits of regular preventive care and encourage all our patents to return for periodic recare visits. Oral health is an essential component of health throughout life. Poor oral health and untreated oral diseases and conditions can have a significant impact on quality of life. They can affect the most basic human needs, including the ability to eat and drink, swallow, maintain proper nutrition, smile, and communicate. Regular check-ups can detect early signs of oral health problems and can lead to treatments that will prevent further damage, and in some cases, reverse the problem. Professional tooth cleaning (prophylaxis) also is important for preventing oral problems. Regular teeth cleaning by a dentist removes plaque that may develop even with careful brushing and flossing, especially in areas that are difficult for you to reach on your own. Professional cleaning includes scaling and polishing. This uses various instruments or devices to loosen and remove deposits from the teeth.. It's important to take care of your mouth and teeth starting in childhood to help avoid problems with your teeth and gums. Brush your teeth at least twice each day with fluoride toothpaste. Thorough tooth brushing and flossing can reduce dental plaque can prevent gingivitis—the mildest form of gum disease. Aim for first thing in the morning and before going to bed. Once a day, use floss or an interdental cleaner to remove food your toothbrush missed. Along with brushing your teeth, you should also be flossing on a daily basis. Flossing will remove plaque and debris in areas that your toothbrush isnít able to reach. There are two types - nylon and single filament. You can get nylon either waxed or un-waxed, in several different flavors. Nylon floss is made up of several strands of nylon material, meaning that it can shred, tear, or snag between the teeth if it gets caught on sharp teeth. Even though the single filament floss is more expensive than nylon, it will slide easily between teeth, even tight areas and spaces. Unlike nylon, single filament is impossible to shred or tear. No matter which type of floss you choose, as long you floss regularly, it will remove debris from your teeth and gums. 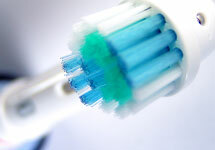 Replace your toothbrush every 3-4 months, or sooner if the bristles appear worn or splayed. Do not share toothbrushes. The exchange of body fluids that such sharing would foster places toothbrush sharers at an increased risk for infections, a particularly important consideration for persons with compromised immune systems or infectious diseases. After brushing, rinse your toothbrush thoroughly with tap water to ensure the removal of toothpaste and debris, allow it to air-dry, and store it in an upright position. If multiple brushes are stored in the same holder, do not allow them to contact each other. Use a fluoride toothpaste. Fluoride's protection against tooth decay works at all ages. Drink water that contains added fluoride if you can. Most public water systems in the United States have added fluoride. Check with your community to see if your water system contains additional fluoride. Eat wisely. Cut down on tooth decay by brushing after meals. The recommended five-a-day helping of fiber-rich fruits and vegetables stimulates salivary flow to aid remineralization of tooth surfaces with early stages of tooth decay. Limit the number of snacks eaten throughout the day. Adults should avoid snacks full of sugars and starches. Don't smoke. In addition to the general health risks posed by tobacco, smokers have 4 times the risk of developing gum disease compared to non-smokers. It raises your risk of gum disease, oral and throat cancers, and oral fungal infections. It also affects the color of your teeth and the smell of your breath. Limit alcohol use. Heavy alcohol use raises your risk of oral and throat cancers. Using alcohol and tobacco together raises your risk of oral cancers more than using one alone.